It’s not often that a game is released with a biblical theme. Well, I should say that it’s not often that a decent game is released with a biblical theme. I’ve rehearsed many times my gripes with Redemption, a Christian CCG whose rules ambiguities caused my friends and me to act less than Christian. Kingdom of Solomon, therefore, is a game that interested me when I saw it on Kickstarter (as it has interested many others). While the theme is from the Bible, it is not didactic and for that reason has appeal beyond what is normally a subset of gamers. It is also produced by a bona fide hobby games company (Minion Games) and has a respected designer’s name on the box (Phillip duBarry). So, what is the verdict on Kingdom of Solomon? Read my wisdom below. 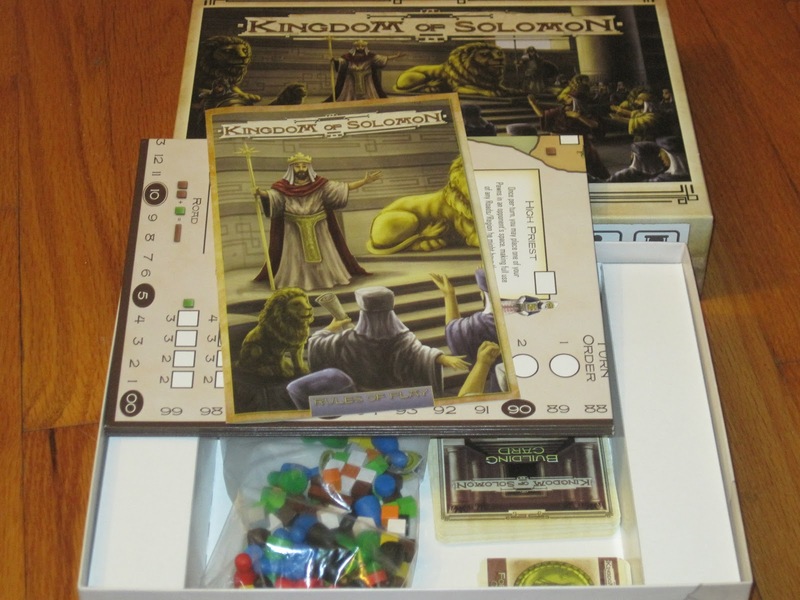 Kingdom of Solomon is a worker-placement game for two to four players. The game has players collecting resources from Solomon’s vast kingdom, buying and selling resources in the market, and building structures, roads, and the famed Temple in Jerusalem. Resources and workers and roads. Oh my! 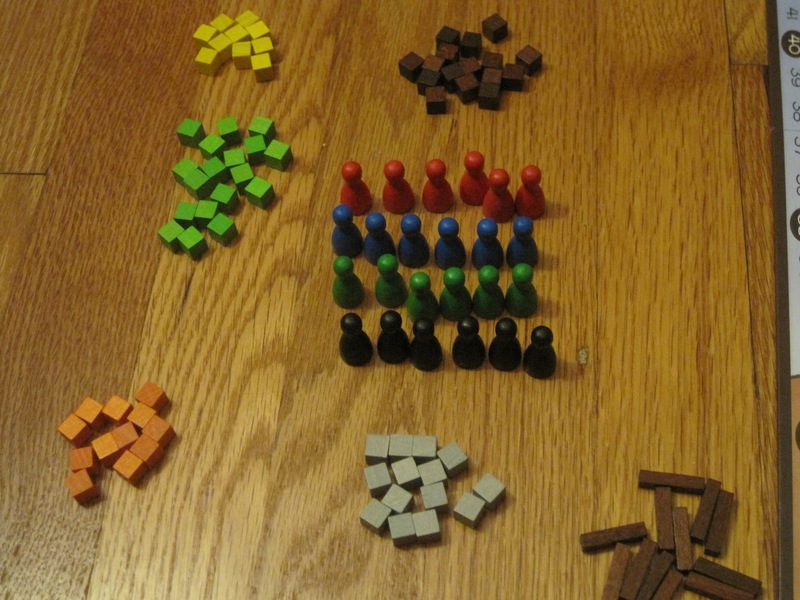 At the start of the game, each player receives several workers. The first phase of a round is the placement phase. In turn order, players place one of their workers on the available spaces. They may place their pawns on the map to collect resources, on action spaces to take actions, on structures they have built to take that structure’s action, or on special action squares, which offer powerful actions but which require all of a player’s remaining pawns to be used. Super action spaces can be powerful, but costly. After players have resolved their workers, the market phase begins. 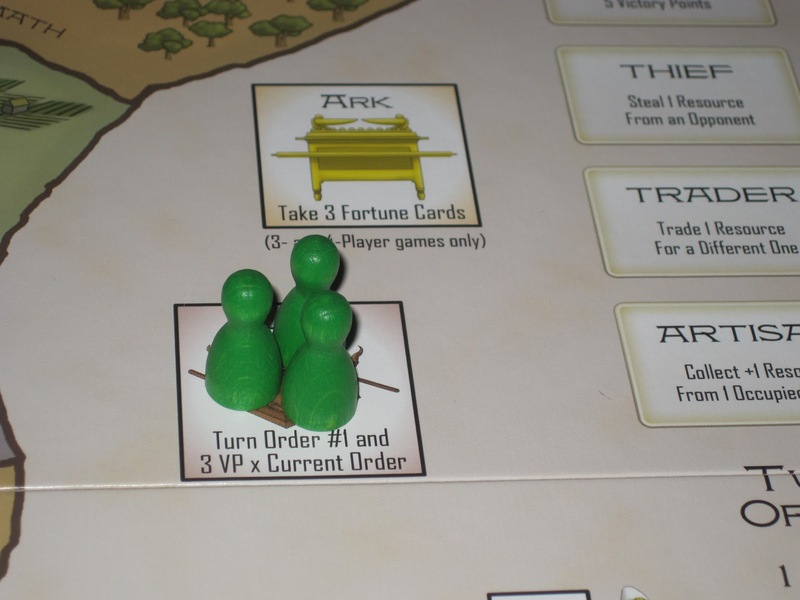 In reverse turn order, players may buy or sell resources, one at a time, using VPs as currency. Players may also pass, but once a player passes, he may not buy or sell again in this round. The market closes once all players have passed. Finally, players may build. Structures provide VPs, special actions, and usually allow players to claim a space on the map with one of their buildings. (Only the player who claims a space on the map may collect resources in that space.) Roads connect claimed spaces on the map to form larger resource regions, essentially making a worker’s resource-collection action more powerful. 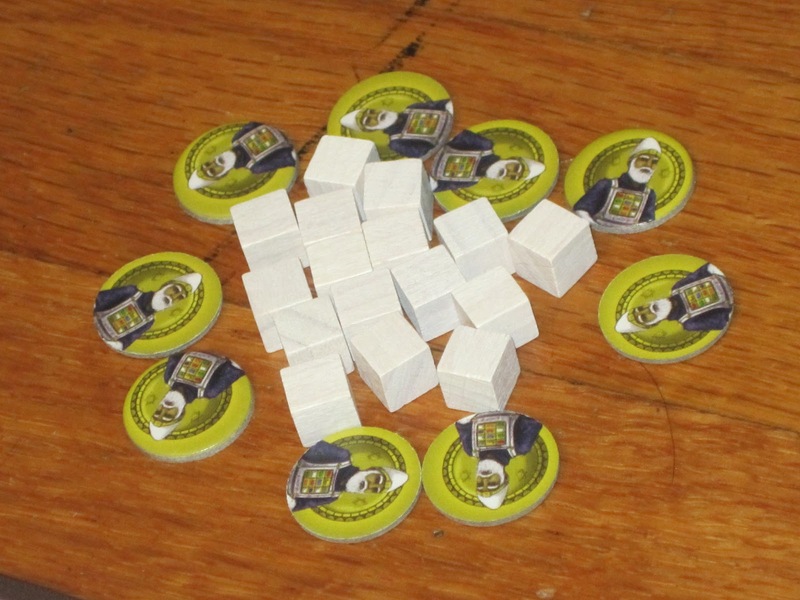 Players may also build squares of the Temple, receiving VPs or high priest tokens for each piece built. Whoever has the most high priest tokens at the start of the round may place one pawn in a space another player has claimed with a building, even using that player’s roads as his own. Fortune cards add flavor and uncertainty. 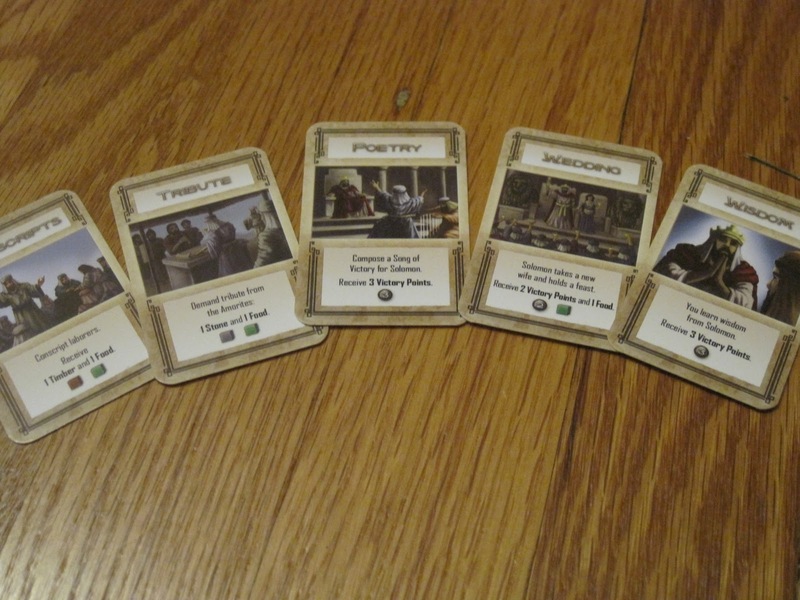 The game also includes Fortune cards, which are thematic and offer some unforeseen benefit to players. 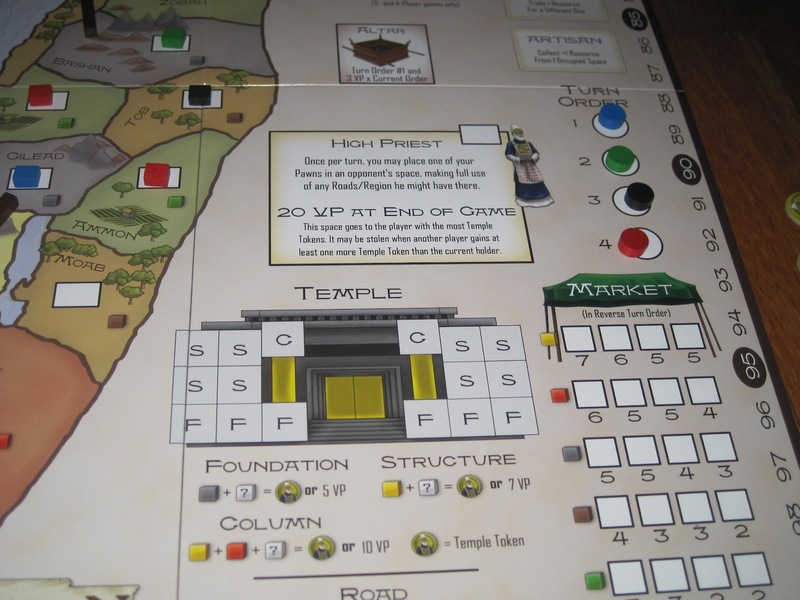 The game ends when either the Temple is fully built or one player has placed all of his buildings on the board, and the player with the most victory points (VPs) wins. Kingdom of Solomon has a fantastic design. It represents the best in worker-placement style games, yet it also innovates in some interesting ways. Kingdom of Solomon offers a good array of choices for players to make when placing their workers. They may choose between resources, actions, and special actions. The resources and actions seem pretty par for the course. Where KoS innovates is in the special actions. Special actions are in general very powerful, offering multiple Fortune cards, multiple resources, and even a change in the ever-important turn order. But because special actions are so great, they are also costly: a player must sacrifice all his remaining workers to claim one of these spots. This isn’t so bad if you’re wondering what to do with your last worker; it can be very costly if you place here first or second. The trick with this choice is that you don’t know when another player will claim the spot you want. Playing for a coveted special action space can be like a game of chicken, and players must therefore carefully consider what the other players will do. The resource region mechanism is fantastic. One of the other innovations included in Kingdom of Solomon is the ability for players to create super resource spaces. Roads help connect spaces a player controls to other resource-bearing spaces. Once these spaces are connected (forming “regions”), a player may place his worker in one space and collect the resources from all connected spaces in the region. This helps players organize their plays early on. Of course, it is another way that the game encourages interaction and competition. Judah is the only space on the board that produces gold. Thus, it makes sense to build near Judah in order to tap into this rare resource. (This also makes sense thematically, a brilliant choice on the designer’s part.) 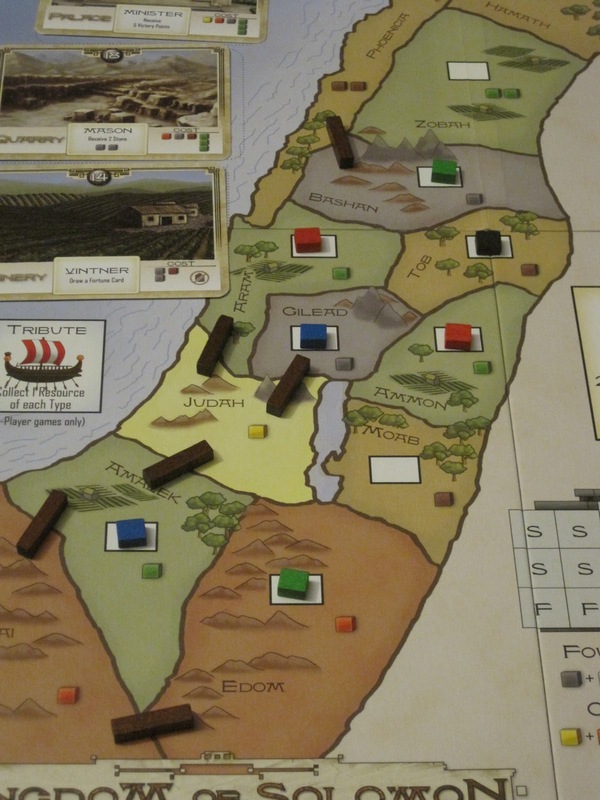 The spaces around Judah are hotly contested at the beginning of the game and ramp up the action quickly, making the game almost feel like a race. The roads also encourage players to build the Temple, as the player who controls the high priest, in addition to scoring bonus points at the end of the game, may place a worker in another player’s resource region to collect resources. I’m not too impressed by the box. That being said, there are some things that are less than stellar in Kingdom of Solomon. 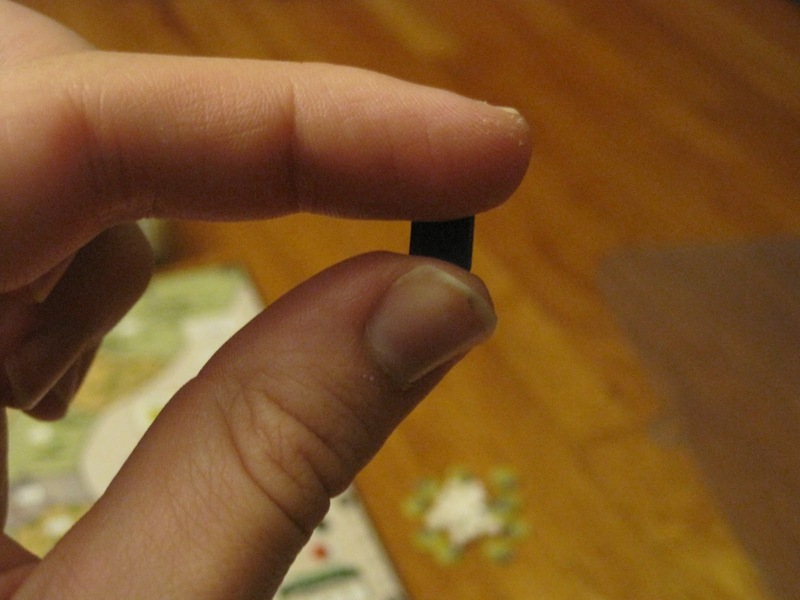 The components, for example, are drab. The game board, while functional and better than a print-and-play board, is not very exciting to look at. The resources are all wooden cubes, the workers are pawns, and the player building pieces are tiny and hard to handle. (The publisher has offered a components upgrade kit in the past, and I believe the second printing of the game will include the upgraded components.) The box size seems inflated a bit, as the board is smaller than the box. The insert is also not very helpful. But these are all cosmetic and easy to overlook because the game itself is interesting. 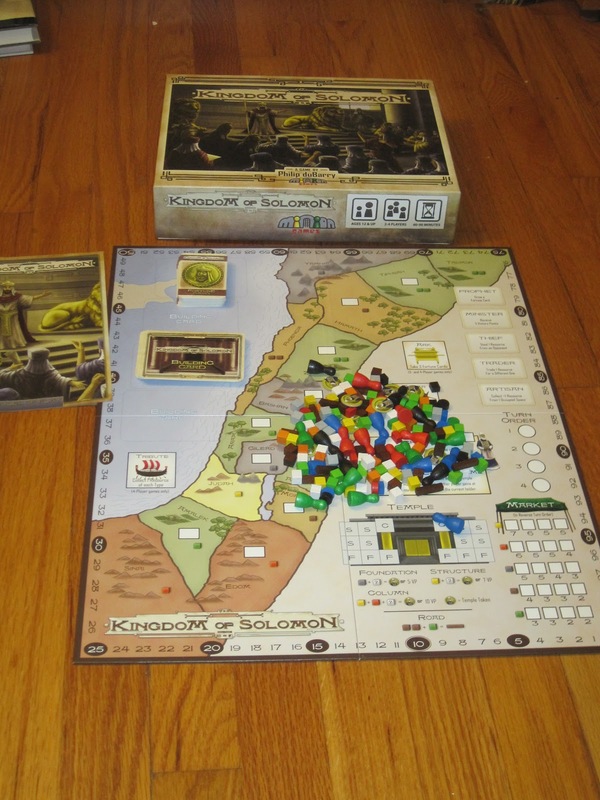 One legitimate shortfall in Kingdom of Solomon is the rulebook. The rulebook, while easy to understand, left many questions for actual gameplay. For example, can players build multiple buildings of the same name? The timeline for building roads and the Temple was also unclear from the rules. The nice thing about this is that the designer and several others have been active in the KoS forums on Board Game Geek, and they have settled all of these questions, even going so far as to release a rules 2.0. Still, the rules as they are in the box are a bit disappointing. Tiny buildings, or fat fingers? You decide. My feelings are neutral about the Fortune cards. They add more of a luck element to the game (as their name might suggest), though their effects are not likely to cause a huge upset to the order. They enhance the flavor of the game, making reference to Solomon’s exploits as recounted in the Bible, but I don’t think I would miss them much if they weren’t included in the game. Kingdom of Solomon is an excellent game. While the theme can be easily lost (this is a Euro game through and through), the game itself is fun to play. It takes what is great about worker-placement-style games and adds a fun layer of interaction beyond the “if I take this space, you can’t” variety. This game should appeal to players who like this style of game already. And, thankfully, it is a game with a biblical theme that really works. iSlaytheDragon would like to thank Minion Games for providing a copy of Kingdom of Solomon for review.